The S.H.E. 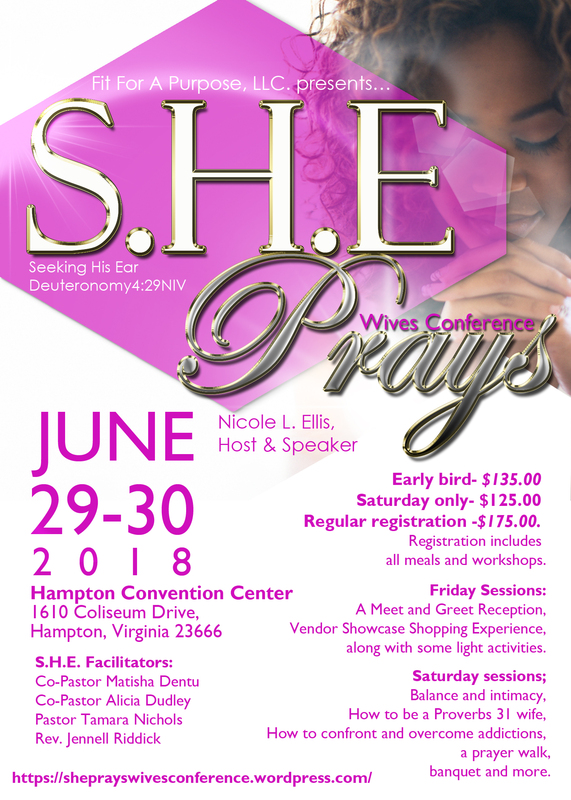 Prays Wives Conference is geared towards inspiring, motivating and encouraging wives to stay the course. Marriage is not easy; however, it’s a powerful ministry when Christ is at the center of it all. Help us impact the lives of others, by donating. Make a donation to this mighty movement of God? Click the “Donate here” button to sow a seed to this ministry effort. Type “S.H.E. Conference” in the note section. Looking for an opportunity to spread the word about your local business? Place an advertisement in the S.H.E. Prays Conference booklet or consider being a sponsor. It’s to too late to sow a seed. Email f4apllc@outlook.com for the form and more information. “S.H.E” stands for Seeking His Ear. As a wife, it’s important to take time with the Father. Join us on June 29-30, 2018 for a life changing experience. Registration includes: all meals, workshops, conference t-shirt, swag bag, pen and notepad. Friday night will include a meet and greet reception, vendor showcase shopping experience, along with some light activities. Saturday sessions will include topics ranging from; Balance and intimacy, How to be a Proverbs 31 wife, How to confront and overcome addictions, a prayer walk, closing banquet and more. Participants should bring comfortable shoes for a prayer walk on Saturday and classy or semi-formal attire for the closing banquet on Saturday night. This promises to be a life changing weekend with phenomenal speakers, fellowship and prayer. Can’t wait to see you in June!